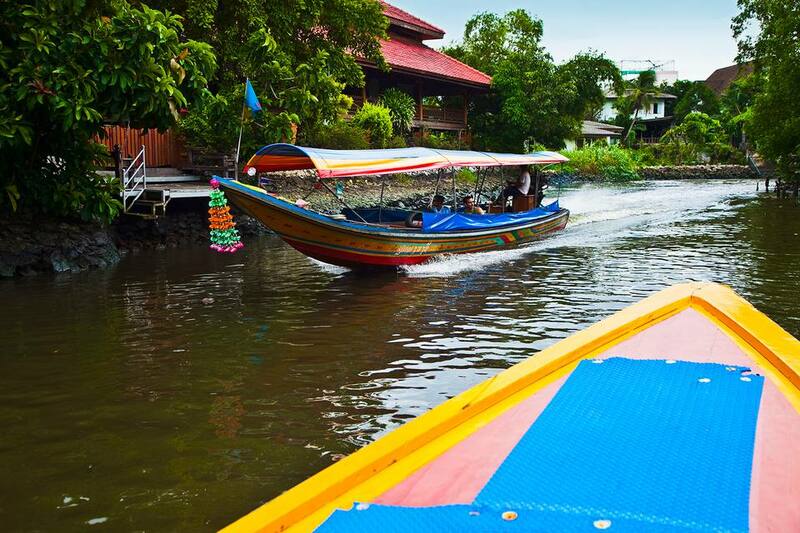 Spend your first day in Bangkok traveling up and down the Chao Phraya River, which runs along the west side of the city. Take one of the public river ferries, which stop at all the important sites and are a lot of fun, too. Along the way, visit Bangkok's most important cultural sites, including Wat Phra Kaew and the Grand Palace and Wat Pho (the Temple of the Reclining Buddha). Depending on where you stay, many of the city's best hotels have free boats that stop either at important sites of major transit hubs like Sathorn Pier. After seeing the city's most important sights, freshen up and then head back out to Bangkok's Chinatown where, if it's not too late, you can get a little shopping in before dinner. Here, you'll find vendors selling traditional Thai food as well as Chinese-inspired dishes that have now become popular. Street food is very inexpensive and you'll see plenty of classics like mango and sticky rice, as well as new-to-you dishes, like the deliciously spicy rolled noodle pork soup at Nai-Ek Roll Noodle. Alternatively, you can instead head to the Patpong Night Market. It's less authentic and more touristy but it can be very entertaining! Today you’ll spend part of the day indulging in one of Bangkok's favorite pastimes, shopping. If it's a weekend, head out to the Chatuchak Weekend Market, where you'll find plenty of souvenirs and gives to bring home, plus lots of other stuff you'd never expected to see in a market. Chatuchak is one of the largest markets in the world, so it's no surprise that you'll find everything from home goods to live animals. If it's a weekday, head instead to one of Bangkok's other amazing shopping spots. Wherever you end up, make sure to take a break and enjoy another of Bangkok's indulgences, Thai massage. You can find massage parlors all over the city and a decent massage shouldn't cost more than 200 baht (around $6). Yes, street food for dinner again! In Bangkok, you can find good street food just about anywhere, but there are a few top Bangkok street food neighborhoods to check out if you need a starting point. Whether you like curry, satay, or soup, Thai street food has all sorts of unique flavors and ingredients to tempt you with. If you only have a couple of days to see Bangkok, try to stay in an area that's close to cultural sights and good food. Take advantage of Bangkok's Public Transportation. It may seem counter intuitive, but generally taking taxis is not the fastest way to get around. Traffic can be awful, and when you only have a limited amount of time, it can ruin your plans!